News on You Call This The Future? Alan Boyle and I talk You Call This The Future? along with science fiction, the singularity and a few other fun things over at MSNBC's Cosmic Log: Why The Future Goes Flooey. 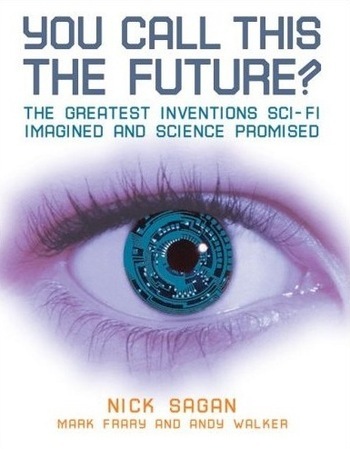 Kilian Melloy reviews You Call This The Future? for EDGE Boston, calling it "well written" and "a fast, absorbing read that possesses a kinetic feel." 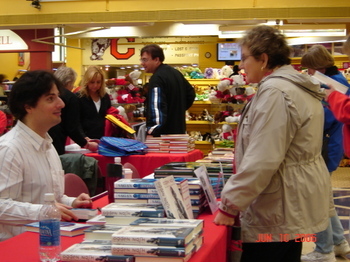 Some photos of the 12th Annual Reunion Weekend Book Signing at Cornell University. Slightly blurry, I'm afraid. 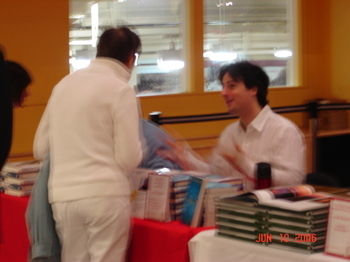 Multiple authors signing at once might be the literary equivalent of speed dating. With so many choices, a reader has a fair chance of finding a book he'll like. I was put between two non-fiction writers: To my right was the very funny Douglas M. Parker, author of Ogden Nash: The Life and Work of America's Laureate of Light Verse, and to my left was photographer Kevin Stearns, who beautifully captured the magic of my hometown (and the surrounding area) with The Finger Lakes Region of New York: A Photographic Portait. Very nice chatting with both of them. Fortunately, I didn't have endless time to talk with my neighbors; I was too busy signing. 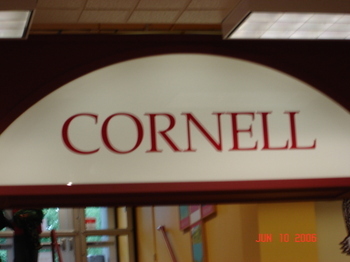 It wasn't my usual crowd, and I don't imagine that many of the Cornell Alumni came to see me specifically, but even so I somehow managed to sell a good number of books. ...and here's an MSNBC article about it by Alan Boyle. Just a few months from now, a brand new Carl Sagan book will hit bookstands. Years ago, my dad participated in the world-famous Gifford Lectures, speaking about science and religion, where they intersect and diverge, and his personal feelings about the two. 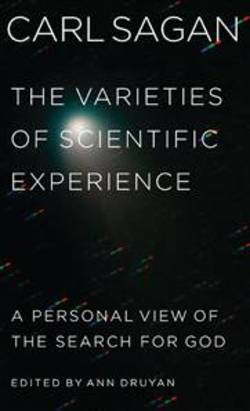 My stepmother, Ann Druyan, has culled that lecture (and the Q&A that folllowed) into a fantastic read: The Varieties of Scientific Experience: A Personal View of the Search for God. What he said back then is so insightful and so genuine, covering fascinating, controversial subject matter, topics I dearly wish I could talk with him about today. I can't recommend this book highly enough. New York, May 1, 2006-Ann Godoff, President and Publisher of The Penguin Press, an imprint of Penguin Group (USA), has announced plans to mark the 10th anniversary of Carl Sagan's death with the release of his previously unpublished "Gifford Lectures in Natural Theology," The Varieties of Scientific Experience: A Personal View of the Search for God. Edited and updated by Ann Druyan, Sagan's widow and long-time collaborator - and including the lecture's original audience Q&A - Varieties explores the relationship between religion and science, and the personal search for God by the brilliant astro-physicist and Pulitzer Prize winner. 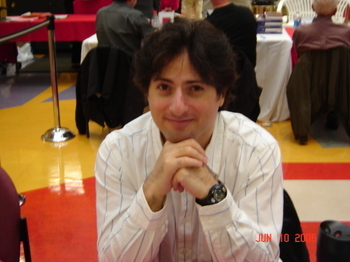 The deal, for North American rights, was made with Sloan Harris of International Creative Management, Inc. 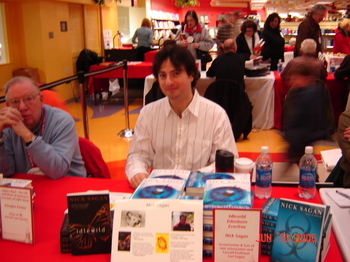 The Penguin Press will publish in November 2006. "Carl's earliest childhood notebooks reflect his passionate curiosity about the nature of God and how the universe came to be," said Druyan. "The Varieties of Scientific Experience is the definitive expression of a lifetime of heartfelt questioning guided by a fearless intelligence." 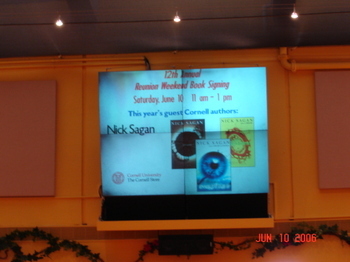 Godoff, who served as publisher and editor of four of Sagan's books while at Random House, added, "A very prescient Carl Sagan's unmistakable voice ponders the pressing question of the intersection of science and religion. Sagan the humanist, Sagan the scientist, Sagan the writer; the reader will close this book and realize that no one has taken his place." Penguin Group (USA) Inc. is the U.S. member of the internationally renowned Penguin Group. Penguin Group (USA) is one of the leading U.S. adult and children's trade book publishers, owning a wide range of imprints and trademarks, including Berkeley Books, Dutton, Frederick Warne, G.P. Putnam's Sons, Grosset & Dunlap, New American Library, Penguin, Philomel, Plume, Puffin, Riverhead Books and Viking, among others. The Penguin Group is part of Pearson plc, the international media company. Everfree is set for a May 18th release, but for individual bookstores, let's call that "May 18th plus or minus a few days," as there's always some variance between shipping schedules. From past experience, I know I can expect a few early "It's here" sightings, along with a few late "No, it still hasn't shown up yet" non-sightings. The former's more fun than the latter. Together, they contribute to a feeling of the process being completely out of my control, which of course it is. 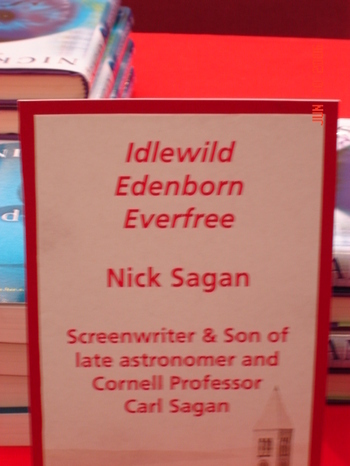 Good news for UK fans: UK publication should be nearly simultaneous with the US, and if I remember correctly, the UK edition of Edenborn actually hit bookstores first. Perhaps the same will happen this time around. Much to be done between now and then. The production teams will do their magic. Galleys show up next month. I still have the Acknowledgments page to write. I'll post the play-by-play as these things happen. My New Year was great, thanks. Admittedly hectic, as I was doing a little eleventh hour tinkering with a story due before the stroke of midnight. (More about that story in a future post.) I enjoyed working on the holiday, as it took my mind off the post-partem blues that come from finishing a novel. It's always comforting to have multiple projects, as I don't relax well, and I hate the restlessness that comes from not having an immediate focus for my creativity. Lucky me, I'm juggling quite a bit right now, but I've yet to find the proper balance to work on all my writing projects and keep the blog current. For example, I'd meant to make this post over a week ago. Also, I've been slow to answer several emails. Backlogged, but hoping to knock them out this week. Bleh. Too much to do. Part of me thinks I should make specific mention of what I'm actually working on, though it goes against the advice a friend of mine gave me back when I first started screenwriting. He said, "Never tell anyone what you're working on, becuase once you do, they'll start asking for it. It's better to be mysterious and then suddenly deliver your projects, so people see you as prolific and unpredictable." Not bad advice, but I'm going to go against it later this week. In the "How cool is this?" category, I've just discovered that the Idlewild and Edenborn audiobooks can be downloaded from iTunes. Type my name into their music store search engine; you'll get two hits. If you're a fan of my books but have yet to hear the audiobooks, why not check them out? HighBridge Audio did a wonderful job on them; Idlewild is dark and paranoid, and with its multiple narrators Edenborn feels like a radio play. Direction, production and performance all sparkle. I'm practically never without an iPod these days. Until recently the selling point has been music, but this is changing; the storage capacity for iPods has been increasing to allow for larger content media--audiobooks, music videos, television shows, etc. We're not far off from having vast libraries in portable format; it's hugely gratifying to know that my books can be added to peoples' collections. 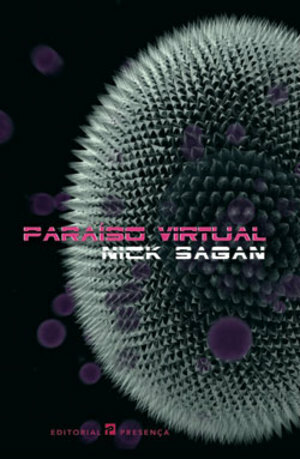 Paraíso Virtual translates into English as "Virtual Paradise," which works on many levels. The naming convention is part of a theme; Idlewild became Ameaça Virtual, which translates as "Virtual Threat." Both are good choices, as the original titles don't translate well into Portuguese. I'm very happy with the art. This cover reminds me of my father's dandelion seed "starship of the imagination" from Cosmos, but on a synthetic, microbial level. Eerie and provocative. It's a great honor to have my work translated into different languages, and a pleasure to work with these publishers. Editorial Presença has been especially good to me, and I'm grateful for all they do.